I've been playing with enamel on metal clay, something that I circle back around to occasionally. I keep thinking that I'll find time to immerse myself in enamels and actually make some of the pieces in my sketchbook designed with them in mind. Of course, since I only play for a short time before I get distracted by the next deadline, I never make as much progress as I'd like, so I've vowing to try to stick with this for a least a little while and try some new things. I use enamels on glass all the time, so the urge to do more enamel on metal is obvious. I like the painterly nature of that material, the luscious burst of color that it imparts, and the challenge of mixing my two favorite media (metal and glass). Whenever I start dabbling with one of my aspirations like this, I inevitably start pulling up inspiration from my collection. I thought maybe you'd like to jaunt along with me on in my explorations, to see who amazes me and lures me to try crazy things. Today, I'm inevitably thinking of Linda Darty, whose book "The Art of Enameling" is by far my favorite on the subject. Linda, in person, is as expansive and charming as her book. I had the pleasure of scheduling a 1-2-1 critique with her at the last PMC Conference, and I came away with pages of scribbled notes, a shopping list for new enamels, and a head bursting with ideas (all still trapped inside, I'm afraid). The first time I ever became aware of Linda's work was at Materials: Hard & Soft, where several pieces from her Garden Brooch Series resided in a case near my wall quilt, "Falling Through the Cracks." 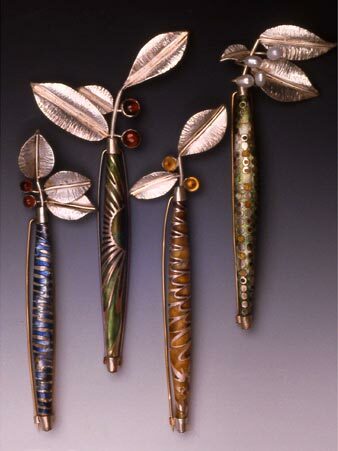 These are still some of my favorites of her work, closely followed her badge brooches and her new hydrangea series. Luckily, I did order the enamels she recommended to me, so they are here waiting for experimentation. I think it's time to get started. Linda's book is definitely my favourite enamel book - just so inspiratioanl! I would love to play with you .... wow, that´s great, I love color on metal and the pics are great. Can´t wait to see what you come with. Linda´s Art is beautiful, thanks for sharing. Have a great day and fun with enamels.